Milwaukee Demolition Work Gloves are designed to provide Ultimate Durability and All Day Comfort. Featuring palms and finger tips reinforced with Armortex, Milwaukee Demolition Work Gloves will provide best in class durability and grip for the most demanding tasks. The integrated Smartswipe Knuckle is designed to allow the use of smart phones and touch screens, without removing gloves or wiping dirty finger tips across the screen. In addition, a breathable lining and built-in terry cloth sweat wipe ensure the gloves remain comfortable all day. Protect your hands during yard work and gardening with the Planter Multi-colored Leather Glove. The durable synthetic leather has foam-padded palms and a stretch spandex back for the ultimate in comfort and protection. The shirred wrist ensures a snug fit for more comfortable work. EGOs breathable work gloves are designed to protect your hands and reduce vibration. 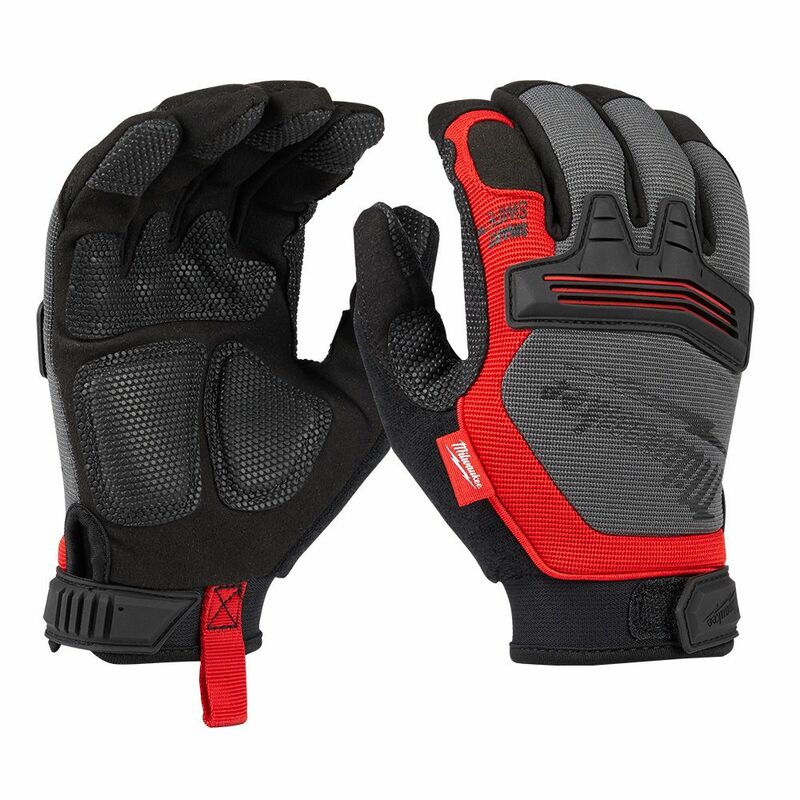 Made with durable synthetic leather and mesh-net polyester fabric, the gloves feature a reinforced palm, knuckle strap and thumb pad for extra protection. Constructed with a Velcro-type wrist band for tight fit, and lined with a light green strip to provide high-visibility, these gloves help tackle any project with ease. Medium Demolition Gloves Milwaukee Demolition Work Gloves are designed to provide Ultimate Durability and All Day Comfort. Featuring palms and finger tips reinforced with Armortex, Milwaukee Demolition Work Gloves will provide best in class durability and grip for the most demanding tasks. The integrated Smartswipe Knuckle is designed to allow the use of smart phones and touch screens, without removing gloves or wiping dirty finger tips across the screen. In addition, a breathable lining and built-in terry cloth sweat wipe ensure the gloves remain comfortable all day. Medium Demolition Gloves is rated 4.3 out of 5 by 69. Rated 5 out of 5 by HomeDepotCustomer from Use them everday at work,very nice and durable!... Use them everday at work,very nice and durable! Rated 4 out of 5 by HomeDepotCustomer from These are good gloves to me they are a nice... These are good gloves to me they are a nice balance of dexterity and protection. The only complaint i have is the smart swipe in the knuckle is awkward. Rated 5 out of 5 by MrMichaelMedia from Look they dont hurt your hands when doing manual labor . I'm talking about digging hoses trenches... Look they dont hurt your hands when doing manual labor . I'm talking about digging hoses trenches , building green houses and stuff like that I got a pair for my wife who work at ups . They last her always 3 month compared to other gloves that last her a month . Rated 5 out of 5 by Keppy from Good fit, comfortable to wear while working. Durable. ... Good fit, comfortable to wear while working. Durable.